Table set, turkey carved, homemade apple, pumpkin and pecan pie ready to be eaten. Table full of loved ones. Thanks offered to the One and Only Lord. Laughter and love for all. Then it happened……the beloved lady pilgrim salt shaker flew “randomly” out of my hand and crashed to the hardwood floor. 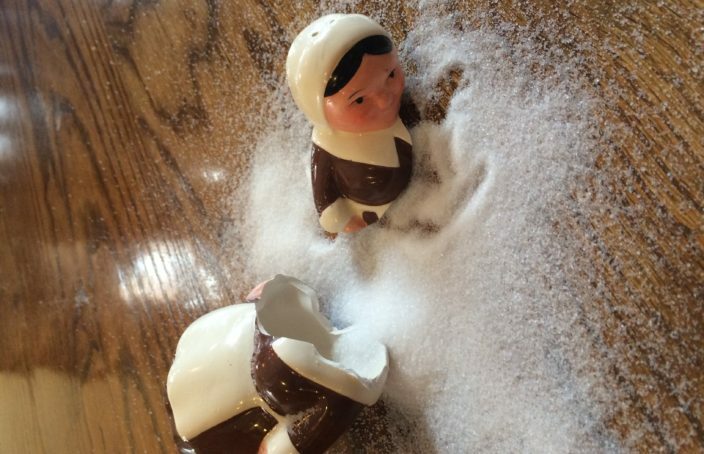 Broken in several pieces with salt scattered everywhere….had that lady pilgrim salt shaker and its companion for over 10 years. Ruined and broken. It can be glued back together but not sure it will ever hold salt again. Maybe if the repair is done just right. No one likes brokenness. Whether the broken happens in things or people, brokenness is just messy and uncomfortable. If we are going to be real and honest, the majority of us want to run from the broken. Just get something new. Move on to the next thing or the next person. Broken is not fun. Brokenness involves hurt and pain. When there is love for anyone or anything, brokenness is a risk we take. Witnessed a lot of brokenness lately: a beautiful 17 year old’s death due to a car accident; a 55 year old’s death due to ALS; several broken families due to a spouse deciding they had enough; broken bodies due to age; broken spirit’s due to hurtful words. When one is broken what is on the inside comes out, according to my friend, Gary Witherall whose wife was martyred in Lebannon. The salt came spilling out of the pilgrim lady salt shaker. Salt can heal. Salt adds flavor. Salt can sting. Looked around that Thanksgiving table of loved ones, we had all experienced some type of brokenness in our lives: broken homes, broken hearts, broken bodies, and broken dreams. A lot of salt spilled at that table. Many times the salt has been used to heal; definitely a lot of flavor and sometimes just hurt and sting. No coincidence, just finished reading Ann Voskamp’s new book, The Broken Way. If you are one that would just soon live a comfortable life, dreaming of a nostalgia that is non-existent in your home or church, then this book is not for you. If you long for Christ to redeem your brokenness, to love through and in your brokenness, then this will take you on a journey to embrace your brokenness and allow Christ to redeem it. With much Thanksgiving in my heart, I’m going to glue that broken pilgrim lady salt shaker back together and set it out every Thanksgiving as a reminder to our entire family to embrace the broken things in our lives!